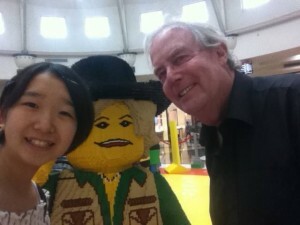 1.Rotary in Australia. Any progress with extra classrooms 2. Rotary Exchange Student. 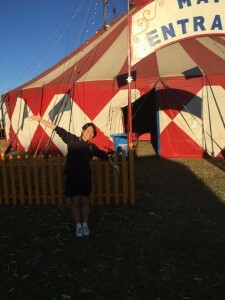 3.Beaudesert Show. 4.Hilary and Avignon. 5. 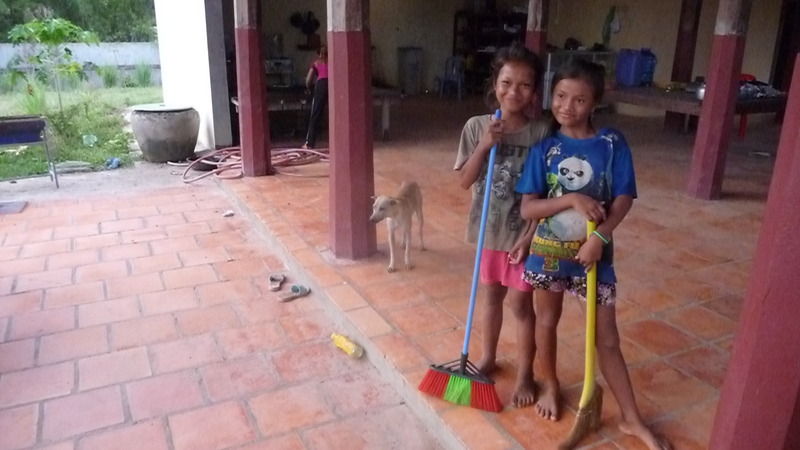 Children at play and Guesthouse chores. 6. Two videos. 1. If you use the Paypal button (Donate Page to the left of screen) we have your DONATION available to us in Cambodia within TWO DAYS of you clicking ‘send’. 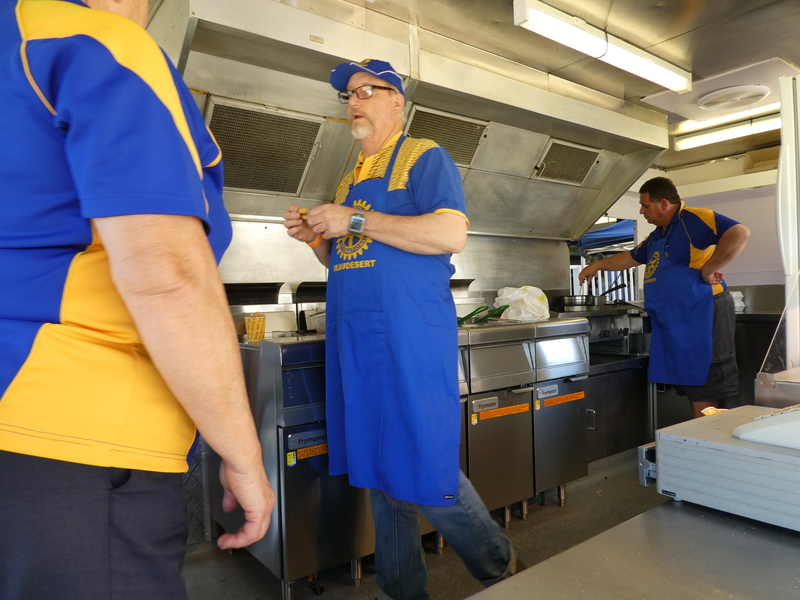 2.The RAWCS (Rotary Australia World Community Service) is now a ‘hyperlink” and that is through Rotary (obviously) and gets to us within a week. The hyperlink is http://www.rawcs.org.au (click on it and search for our project – The project name is “Cambodia 55 2007-08″ …. 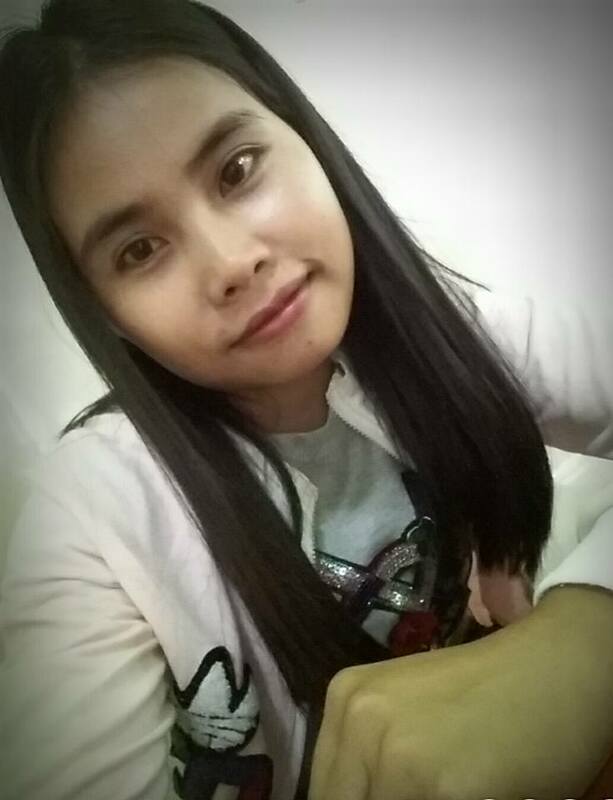 we were registered as that name and number – International project – BEFORE naming it EducatingCambodia, so the above registration name and number is how to find us through this RAWCS donation pathway- it will take you one minute to find the project. 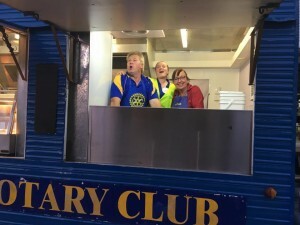 Its up to you which you might choose – PayPal or RAWCS – Members of Rotary tend to choose the Rotary (RAWCS) link and that is partly because – within Australia donations are tax deductible – for anyone. ANYONE can donate through either the Paypal link OR the RAWCS link. The PayPal link is easier and just as secure but Rotarians might prefer the Rotary pathway. We will start with introductory notes for all first time visitors to our website: The paragraphs below, in italics, appear before every post. Unlike any previous posting we’ve divided this post into six areas. Overall, today, there are introductory notes and photo captions plus there are two new videos and 26 new photos (plus two reminders!). 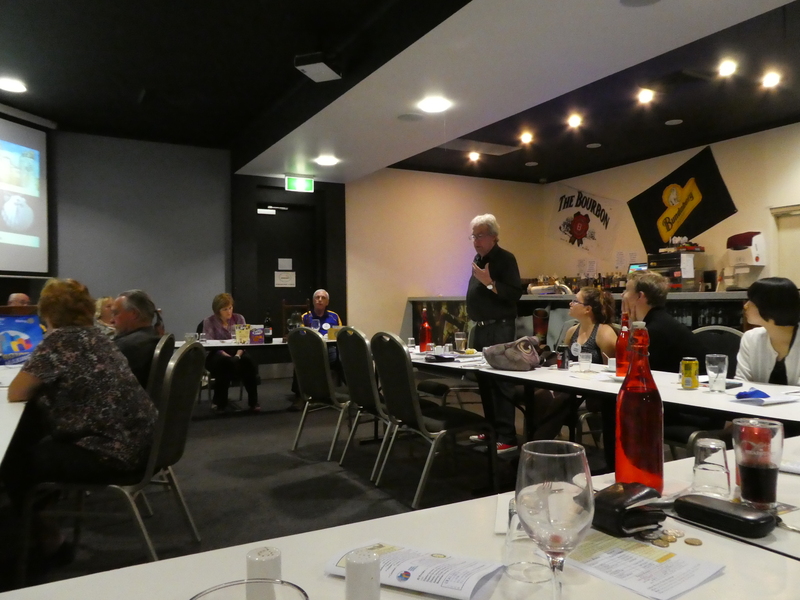 After my return to Australia – At the weekly meeting of The Rotary Club of Beaudesert on September 19 at the usual venue of The Logan and Albert Hotel. In the first photo you can just see Linda and then Mark, then Susan – our Club President, then Jeff our Treasurer, then me – John, Lauren and Mathew. 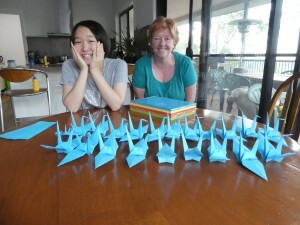 Nodoka our Rotary Exchange Student from Japan. (more on Nodoka below). 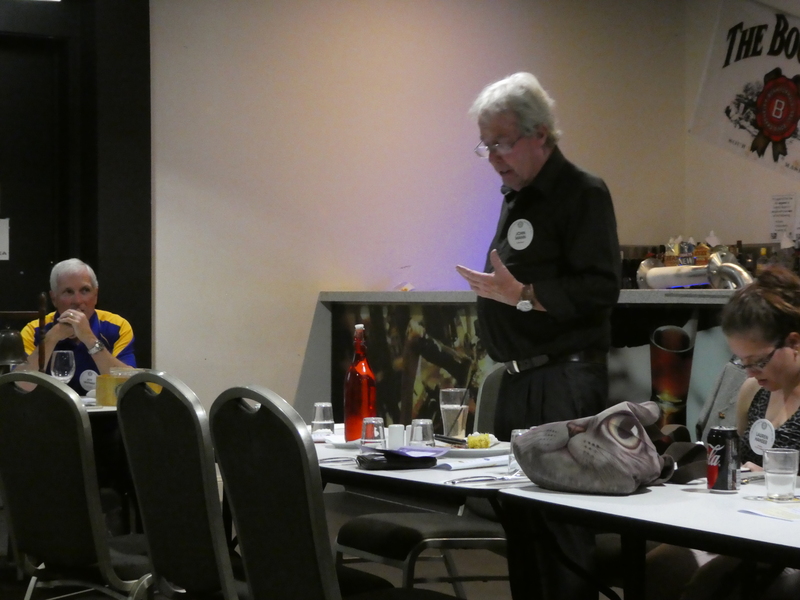 I was giving The Club an update about my recent and latest three months in Cambodia. 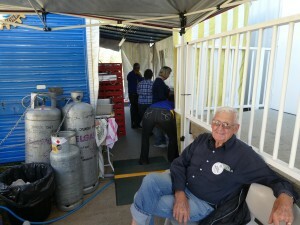 October 11 in the Queensland town of Harrisville there will be a ‘cluster meeting’ of five neighbouring Rotary Clubs. I’m given the chance to give a brief overview presentation of our work in Cambodia. We need a partner club or group of clubs to join us so any outcome will be interesting and welcome. October 28 is the 60th anniversary dinner of The Rotary Club of Beaudesert – more below. As reported several times recently we NEED more classroom space . We have 1340 children and ten classrooms – and even in two shifts of early morning through to early evening we are very overcrowded. 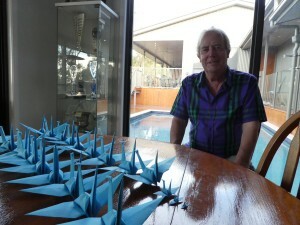 We are talking with a person from The Gold Coast of Australia who might be able to help us. Please everyone note that we also pay our teachers, buy books, maintain the buildings etc etc and that anyone who funds the building of say a classroom block gets the naming rights and therefore remembered forever! ANYONE can donate ANY amount and a browse through the DONATE and DONOR sections to the left of your screen will tell you what we need.. but any ideas from YOU are very VERY welcome. 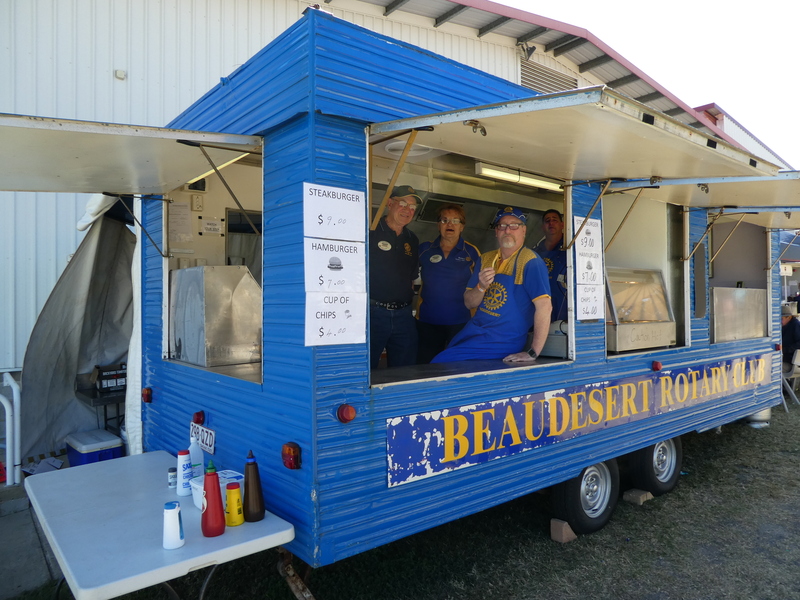 On October 28 The Rotary Cub of Beaudesert will be 60 years old! To help celebrate the Club is hosting a BIG dinner. 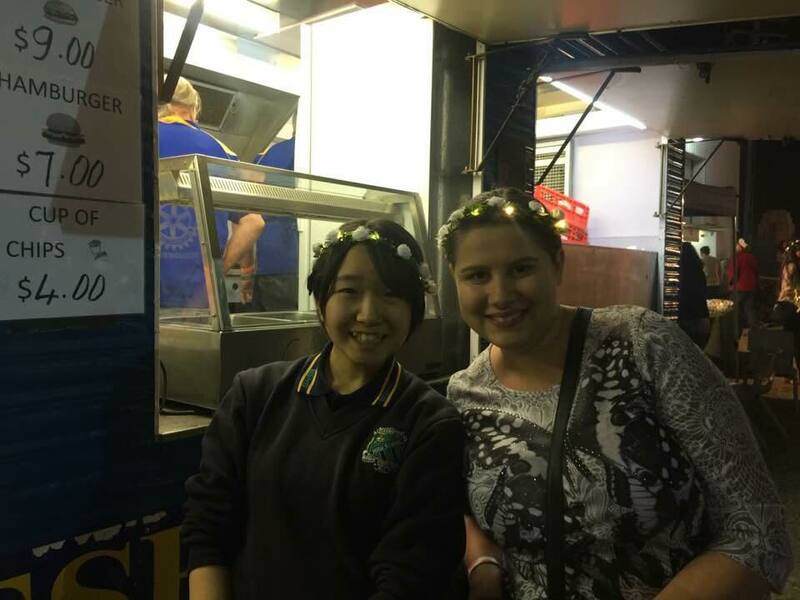 The two photos above – Nodoka is our one year Rotary Exchange student from Japan. Nodoka is making paper crane table settings. Nodoka is sitting next to Linda. More on both Nodoka AND Linda below. 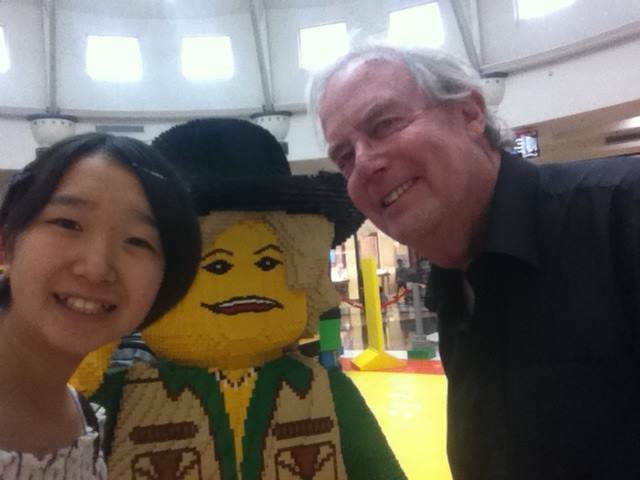 When I am in Australia I live with my friends Mark and Linda. The three of us sitting on that couch are the Committee along with Chanthou in Cambodia which runs EducatingCambodia – what we do in the villages. Bam and Rowdie complete the picture with Rowdie sitting in MY chair guarding my wine. Mark and Linda funded the building of The Guesthouse and have visited Cambodia eight out of the past Nine years and are coming again in January 2018. Mark and Linda love our Schools and our Schools and our 1340 children love Mark and Linda. 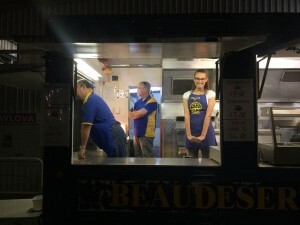 My faithful camera had finally died and the two Rotary meeting photos above, together with the photo with the dogs, plus the first three Beaudesert Show photos, below, were taken with my brand new Panasonic Lumix TZ80 with a Leica lens. (‘The Dogs and us’ photo was taken from a tripod and delayed exposure.) 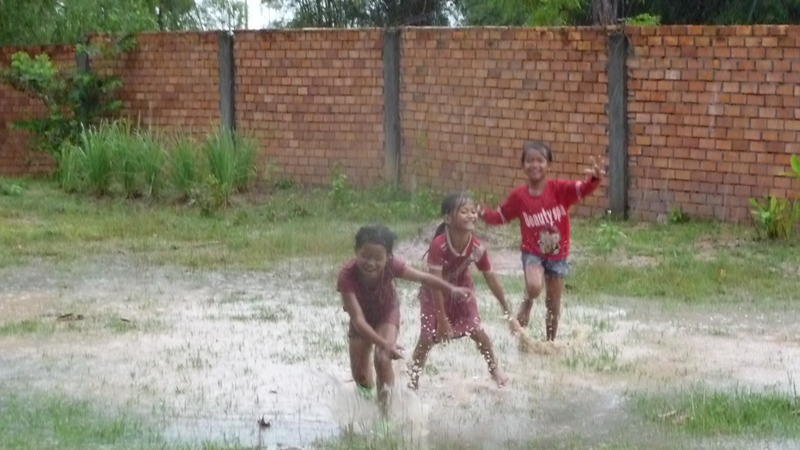 Looking forward to getting the camera back to Cambodia. 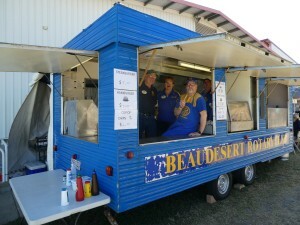 The Beudesert Show is Beaudesert Rotary Club’s biggest fund raiser each year. 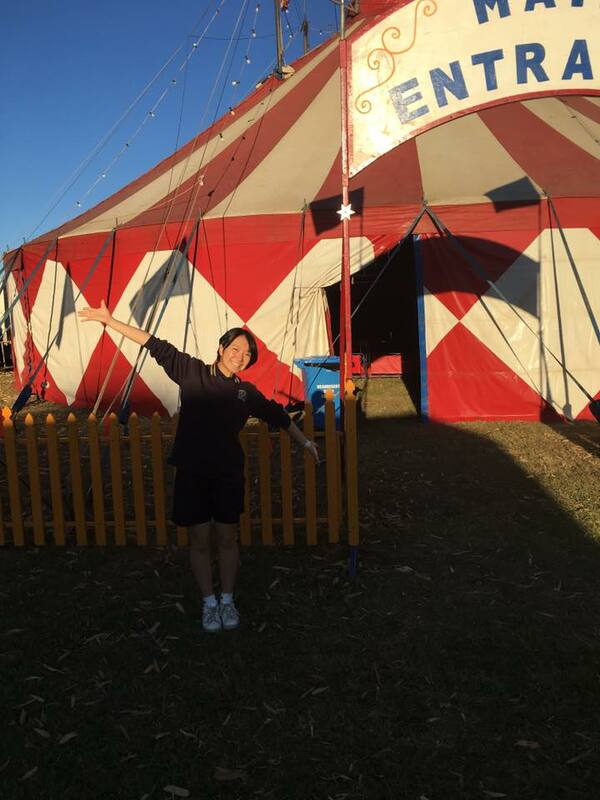 The Show is a two day event – a country show of animal and produce competitions from beef and grain to vegetables and flowers – art and cake making to show dogs and horse jumping – a fairground and food stalls…. 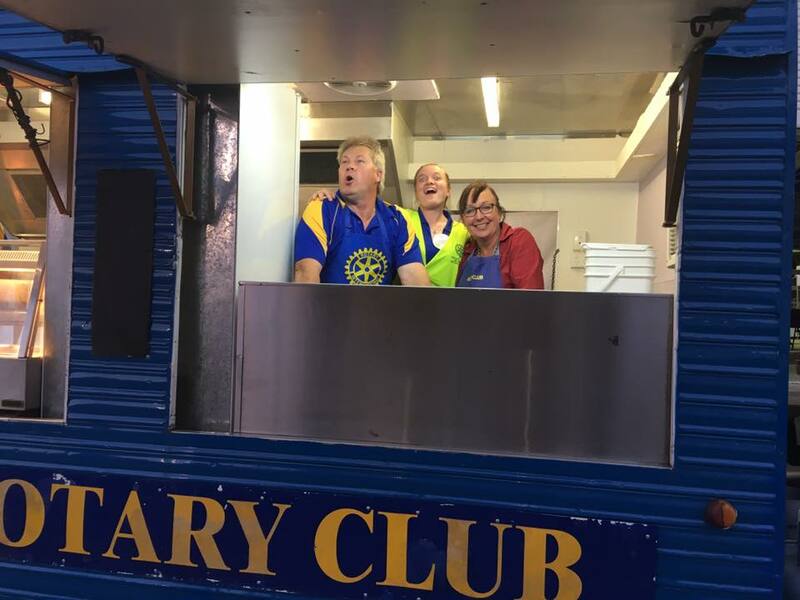 and that’s where we come in; The Rotary van cooks burgers, steaks and chips and Rotarians (members of Rotary) volunteer to raise money for Club Projects. 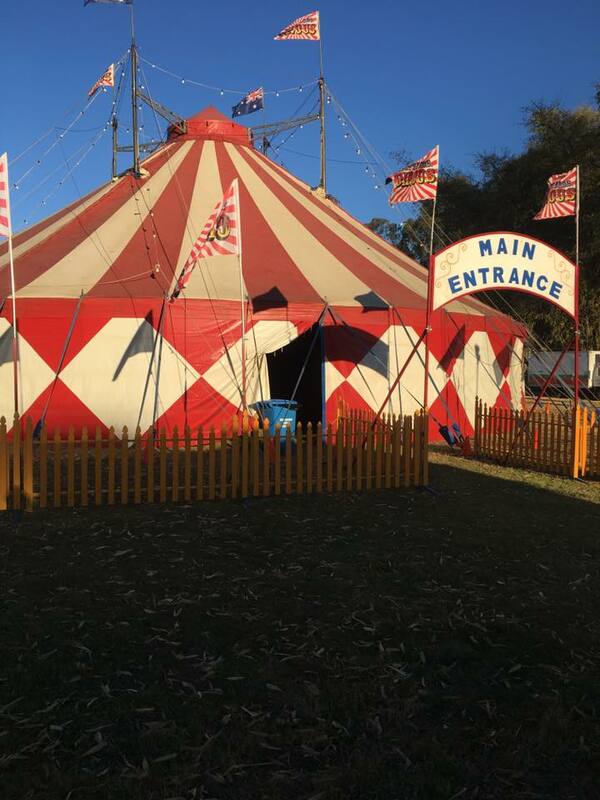 This year we had members of The Fassifern Club helping us – Fassifern Club will be at the Cluster meeting described above for October 11. In this photo. Doug is sitting. Doug came with his wife Joy to Cambodia some years ago – as did Marc McCabe who is in the previous photo. Geoff Gillow is also in the previous photo – frying chips. These next five photos were taken with Nodoka’s camera! 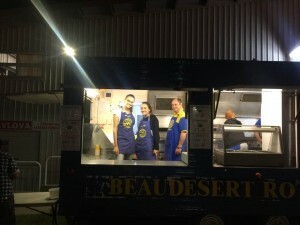 Members David, Tamara and Kathy in the food van. 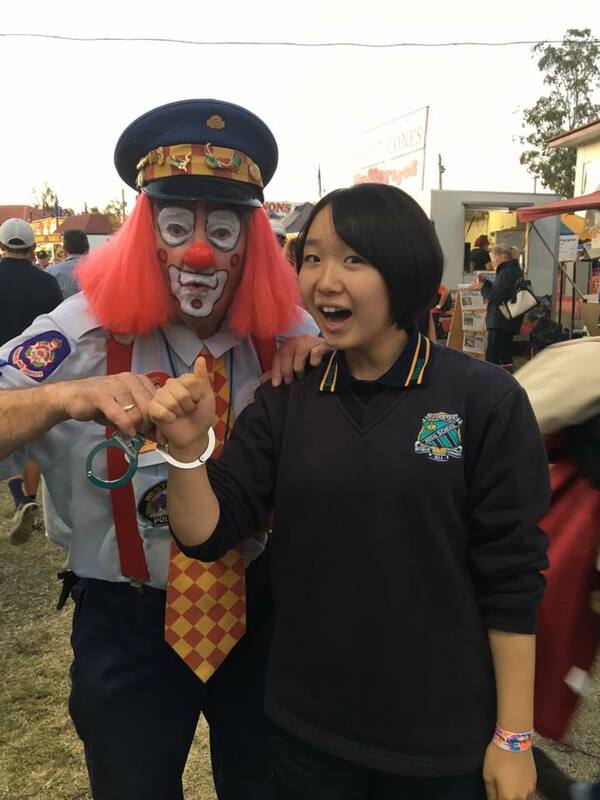 Nodoka is wearing her Beaudesert High School uniform. The Beaudesert Show continues for two days until 10pm each night. These three photos were taken by Club member – Lesley. In Lesley’s three photos we see Shane our immediate Past President, Peter, who does lots of great project volunteer work in The Solomon Islands.. and Eliza who is Lesley’s daughter. In the SECOND photo we see Eliza with Arantza our Spanish Rotary Exchange Student (like Nodoka but from Spain!) and Shane again. We also get a glimpse of Linda at the Chip Fryer. 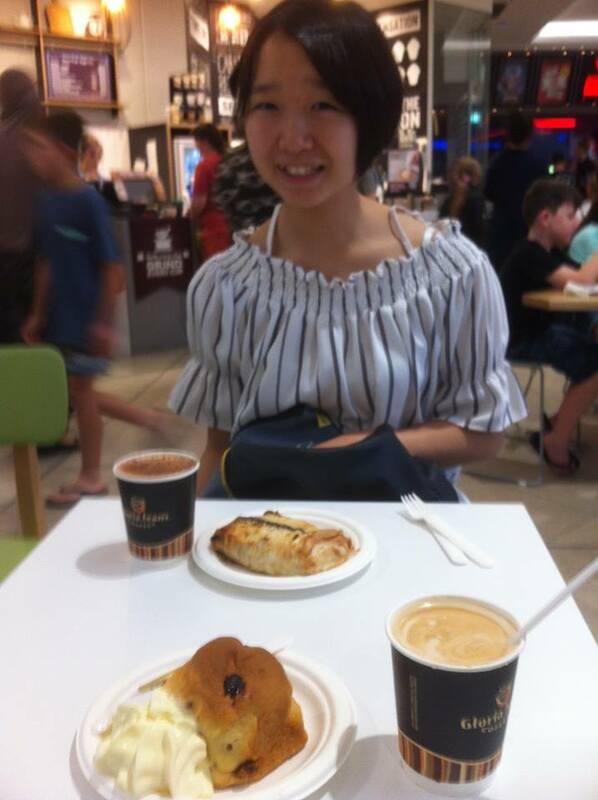 A few days ago I took Nodoka (see above also) to The Grand Plaza Shopping Centre – 40 minutes north of Beaudesert. Nodoka didn’t want Sushi, she wanted a Chicken and avocado fillo roll. My meal was slightly less healthy – Scone, jam and a lot of cream.. yum. Long time readers will be used to “France” updates from Antibes. Hilary and all her friends in Antibes plus all Hilary’s visitors and performers from around the world soon became our BIGGEST donors. Hilary moved to Avignon with her wonderful craftsman (and guitarist) husband Jean Pierre and built a THEATRE within her historic town house just a ten paces from The Opera House of Avignon. 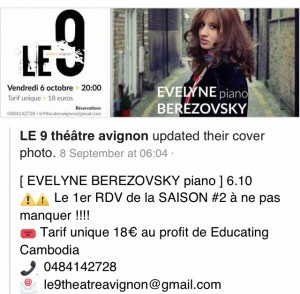 Hilary’s new Theatre is named Le9 Theatre Avignon – it just happens to be the street number. There are photos if you scroll back in time starting around 14 months ago when I was present for a tiny bit of the HUGE and incredible building phase. Please read the poster above. There is a performance on October 6 and Hilary has just told me – there is an extra performance on the 5th! So if you are anywhere near Planet Earth on the 5th or 6th of October – there is a great Concert on in Avignon and OUR children in Kamchay Mear district of Prey Veng, Cambodia will receive the help they so seriously need. Please remember or know that 100% of donated money is spent on our Children’s Education. Other projects such as individual health needs or help with village farming are dealt with as completely separately funded projects but again, 100% of money raised goes to the project. 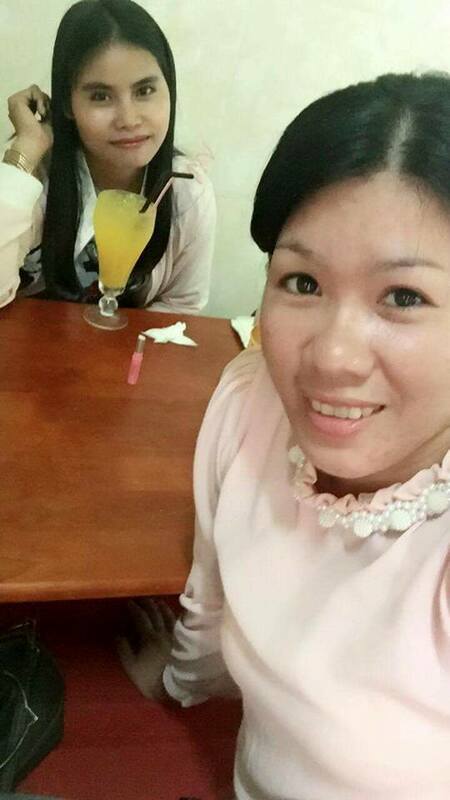 We employ NO ONE except Cambodian teachers. While I’m away in Australia, the teachers often send me photos. On the left we have Sreymao and on the right Sreymao is joined by SoNita. Great teachers. When not at school a lot of our children call in to play and talk at The Guesthouse. 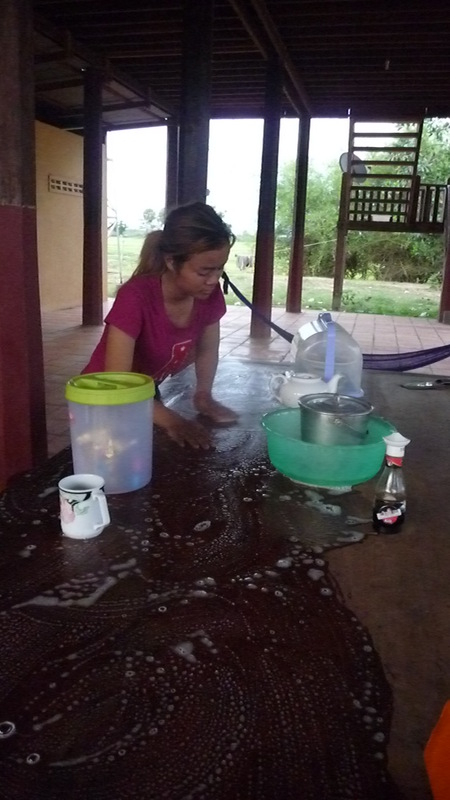 Chanthai is THE Housekeeper. 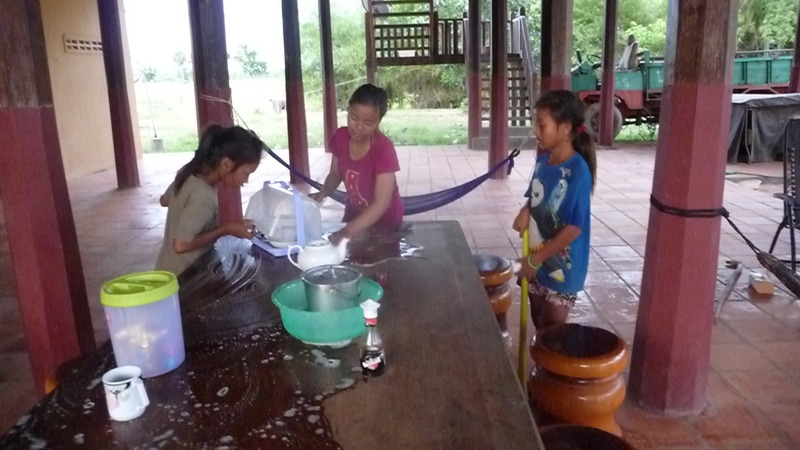 Chanthai is firm and kind with sometimes 20 children at a time ….. sooo she gets them happily cleaning. All three of the girls in the photo above have their own sections in “village children’ – one of the sections to the left of your screen. Micara, Chanthai and Chanthay. 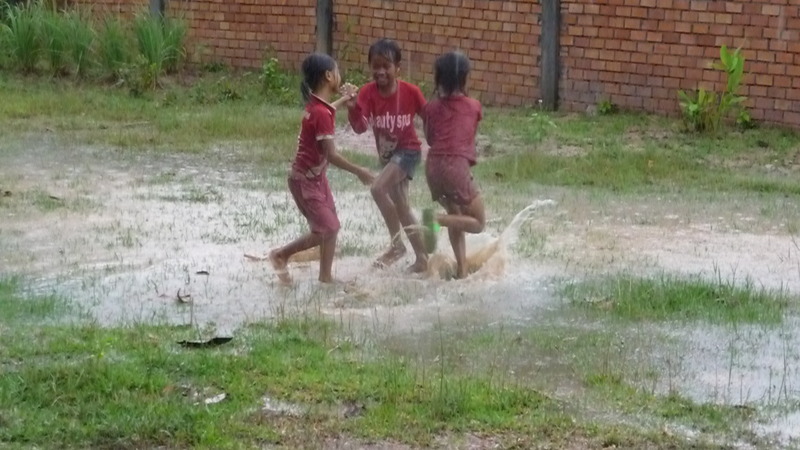 … and I’ve added the two ‘playing in the rain’ photos from last month just to remind you that its not all work! Ironwork and the Gate almost finished. Things built traditionally with craft skills, hard work and love… and built to last. Last but by no means least. Just to show you how all our incredible skilled carpentry is done! TRADITIONALLY and BY HAND. This would be one of the oldest working saws in the world and it’s in our villages. Known variously around the world as a Pack Saw or Bow Saw or Frame Saw. Lots of news coming soon so that is when we’ll write again, John.